I opened my hood today to see my brake level well below the *low* level. Yikes. I’ve got a slow leak somewhere, and if I had to guess I’d say something got tweaked while offroading last year. Six months ago my brake fluid was low so I topped it off, and now it’s low again. 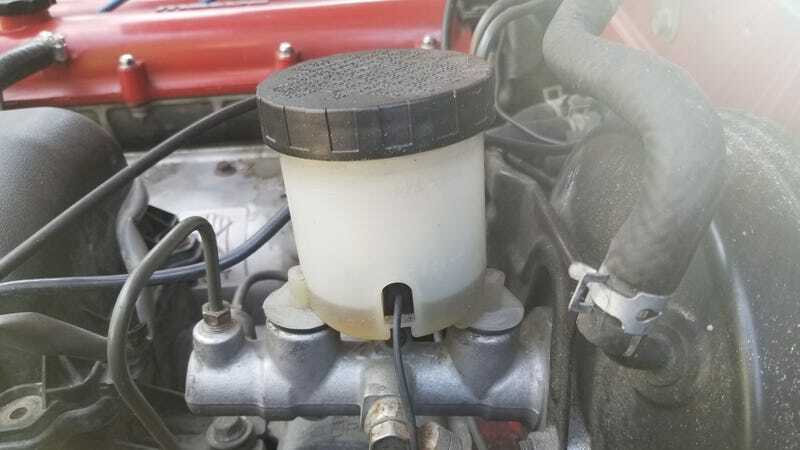 I know you’re not supposed to use brake fluid that’s already been opened but I’d imagine oldish fluid is much preferable to none. So! I need to track down the source of the leak and fix it. I need to get my parking brake adjusted. Wilwood says that their parking brake is pretty weak, but at this point mine does basically nothing. Fronts. I’m almost completely through the slotted sections... Is this wear pattern normal? Should I adjust the brake bias a bit? Eventually I’d like to find a pad that doesn’t squeal like a stuck pig, but that might also have to do with the crusty rotors..? Idk. It’s been almost two years of daily driving and the pads still have a ton of life on them. Unfortunately without an odometer it’s hard to guestimate mileage, but that seems like a lot of life out of these pads. I hate brakes. The first *big* job on the Miata was a wilwood brake kit on all 4 corners and it was miserable. Tons of broken parts, incorrect parts, bad or just straight incorrect directions.... And I had a 30 year veteran of muscle car/hot rod restos working with me! Eventually we handed it off to a brake shop, and even they had a nightmare of a time getting everything functioning correctly. Still, after that was all sorted out the brakes have been great!